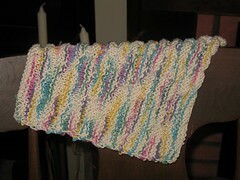 I've finished warshrag #4, and it's already in the towel basket in Mom's kitchen. It stopped briefly on the piano to pose. 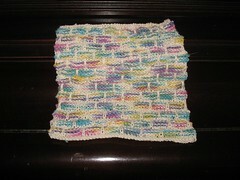 This is first one I've made out of variegated yarn. It's Peaches'n'Cream in the Potpourri colorway, with Ecru for the background. This is very pretty, but I think I like the solid colors better, because you can see the pattern more clearly. Interestingly, the back of the variegated piece is less obviously "back-like" -- the front and back look more alike. Here's the back of warshrag #4, lounging over the back of a rocking chair.